We pulled into MCG last week and I noticed that we had an audience up on the hill. The plan was to back in perfectly parallel with the pad while not running over anything; shockingly, I did so, perfectly. But I still heard a familiar guffaw. Turned out to be Linda, the erstwhile pig cooker from Tennessee! It’s great to pull into a new CG and find that your old buddies are already there. 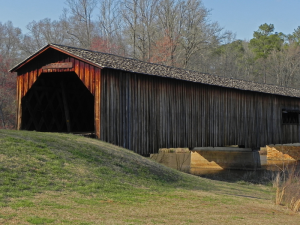 Watson Mill Bridge State Park in Ga. When we started this trip as usual, we strapped the fat cat in his harness and leash! Neither one of us want a sail cat, so, for his safety he gets strapped in. So, you ask “why not use a cage?” Not this cat, are you kidding? He freaks out on us so that idea is out of the question. By now, he knows the routine. After all, it is for his own good. I’m sure he must know that! Yet, he looks at us in such a way, one would think be believes we are treating him like a dog! The leash was hooked on the table leg and there’s just enough length that he can hop up on the chair on that comfortable cushion and sleep off the nausia he gets from the motion of the trip. I was wondering how he would be fairing, so I check on on fat cat and low and behold, he had managed to get out of the harness! He never moved and kept us fooled for over 50 miles or so. Next stop, we strapped him in again, and once again, he wiggled out of it and stayed put! Hmmm, guess that stubborn cat won! Now, we just have to see if we can trust him to stay put, if not, we’ll have to resort to a cage and I know he hates that. That’s why I remind him from time to time, better stay put or the cage it is!